iConverged: (Book Review) Cocos2D – Its raining books, Hallelujah! "This book will teach you the fundamentals of how to write games with this framework. As this book is meant to give you a basic knowledge of the most important aspects of Cocos2d, it will cover a lot of subjects very quickly. However, do not worry! Almost every chapter will include tasks for you to complete and examples for you to practice. Throughout this book, we'll make three different games and each chapter will build on the previous one, but can also be considered independently, so feel free to skip to any chapter that interests you." So this post is a review of this new book by Pablo. Full Disclosure: I was contacted by the company to review their book - they gave me a free e-copy so I could read and comment. Beyond this, I have no monetary or any other form of profit/benefit from this post. In other words, if I thought this book is crap, I can call it crap. If I think its good, I can call it good. 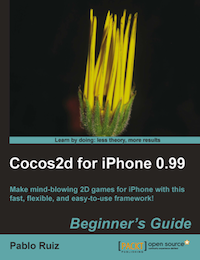 So how is Pablo Ruiz's "Cocos2D for iPhone 0.99" ? Its 350 pages of relevant content. The author dives into topics quickly and gets to code examples very soon. He continues the same board game across Chapters 3&4 (another 55 odd pages), where he embellished the game with actions (the usual CC actions along with the ease in action effects). There is a nice page in his book that shows the animation path of each ease action. It looks like it was copy pasted from some standards reference - if so, then you may already know about it - but to me, it was nice to see the easein/out effects on one page. Finally, in Chapter 4, he shows us how to add fonts and text labels to the game and goes through the basics on how to create your own font with CCBitmapFontAtlas. In Chapter 8, he covers background panning using tilemaps. Nothing new or unique here. But if you don't know tilemaps, here it is. What stands out from the others in this book is the chapter on Chipmunk. Chipmunk is a physics engine that can add realism to your games (like the toppling monuments in angry birds). Most tutorials and books cover Box2D (even Steffen's book I reviewed earlier). Box2D seems more able, but is reasonably more complicated. And I really wanted a good reference to chipmunk (as a beginner). I was very happy to see Pablo cover chipmunk. Just for that, I'd give him kudos. And also, he goes through several pages in building a relevant game - a totem block, that rests on top of various blocks of different shapes. Your goal is to remove the blocks without the totem falling on the floor. There is also a chapter on OpenFeint - I liked it. Frankly, I never knew about it. OpenFeint is a software library you can link your code with that allows your game to become "social". In other words, you get access to leader boards, get notifications on new scores from your buddies in your network, connect and post messages to Face Book and more. Yep, you guessed it. It can also become a nightmarish tool if you choose to abuse it (remember those beyond irritating messages from all your friends in facebook about some idiotic occurrence in some mafia game they were playing etc.) Used properly, OpenFeint looks like a very nice tool and Pablo covers it well. The book is hurried. Just too hurried. When you start focusing on a topic into the next level of detail, you feel like the author is trying to complete a race in record time. While at first glance, it looks like he has spent time with details, when you really want to understand something new, you feel he should have spent more time with details. Finally, he asks us to introduce a line declaring a totem variable, which never compiles because the instructions forgot to tell us to declare it first (and there too, he says in another example "declare an ivar" - thats all). Again, not an issue for those who know, but if you are really a beginner, you will feel lost at his pace and choice to ignore details. There may be other issues, I am on travel, so I could not do a thorough read. Verdict - Better than Steffen Itterheims Cocos2d book? Frankly, from what I read so far, I don't think so. While Pablo's book covers more topics, the one chapter I actually decided to dive into came out with several errors. Steffen's book is more thought out and not hurried at all. And I'd say there i around 60-70% intersection of topics between the books. And unless I try out more of Pablo's code in the book, I can't honestly say it is the book for beginners. But besides that, it covers enough topics to be of interest. I think if Pablo spent more time with details on the book, it would be a treasure trove. Also, there is limited (or no) handling of the more advanced Cocos2D functions like isometric tilemaps, Cocos2D Camera, Parallax scrolling etc. Having said all of the above, I think the author will likely improve the quality of the book in future versions. Well, if it was the first book, I would buy it. Since I already have one book and I will surely buy the one by Rod & Ray (just because of the reputation), it makes buying this book a not-so-easy-choice. For those who choose to buy it, it will give you lots of help and a great head start. But be expected to be rushed and brace yourselves for errors in code.